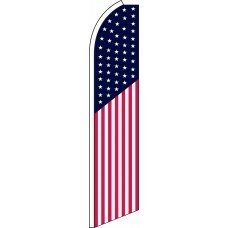 Our USA-themed Swooper Flags are our most popular category of feather flags. 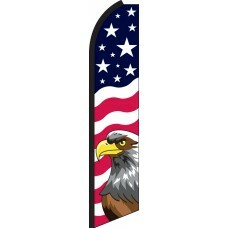 We offer several variations of patriotic Flags which will enable you to show your patriotism while offering striking graphics that attract the attention of potential customers. One of the advantages of utilizing USA-themed patriotic designs is that you can often avoid local ordinances which prohibit feather flags, but allow American Flags. Many of our customers are able display our USA Swooper Flag which features 50 stars to closely resemble the American Flag operate within the parameters of local laws. 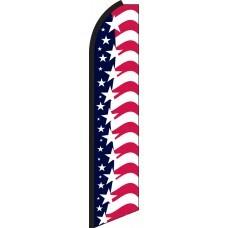 Patriotic Feather Flags are most popular during the summer months. Businesses often display these flags during the July 4th Independence Day holiday and Memorial Day as a way to show their patriotism. In our modern climate of political controversy, Patriotism is one thing that never goes out of style! Our USA flag is the most popular design, however, the Stars & Bars, Stars & Bars W/Eagle, and Star Spangled Banner designs are also very popular. 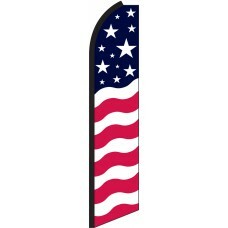 Why not buy an assortment of these flags and decorate your business with a truly eye-catching American display? 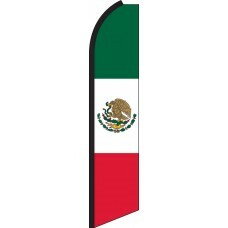 In addition to American-themed feather flags, we also carry Swooper Flags that closely resemble the Mexico Flag and Canadian Flag. 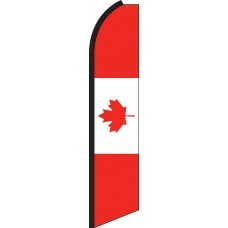 The Canada Swooper Flag is popularly used by businesses in Canada to show their pride in country. The Mexican Swooper Flag is often used in areas of the United States where there are large Mexican populations and throughout Mexico as a way for individuals and businesses to display their heritage.